"You can switch the material states back and forth, and in each of those states, the material acts as though it were a completely different material, even though it's made of all the same components," says Jeremiah Johnson, an associate professor of chemistry at MIT, a member of MIT's Koch Institute for Integrative Cancer Research and the Program in Polymers and Soft Matter, and the leader of the research team. The material consists of polymers attached to a light-sensitive molecule that can be used to alter the bonds formed within the material. Such materials could be used to coat objects such as cars or satellites, giving them the ability to heal after being damaged, though such applications are still far in the future, Johnson says. The lead author of the paper, which appears in the July 18 issue of Nature, is MIT graduate student Yuwei Gu. Other authors are MIT graduate student Eric Alt, MIT assistant professor of chemistry Adam Willard, and Heng Wang and Xiaopeng Li of the University of South Florida. Many of the properties of polymers, such as their stiffness and their ability to expand, are controlled by their topology—how the components of the material are arranged. Usually, once a material is formed, its topology cannot be changed reversibly. For example, a rubber ball remains elastic and cannot be made brittle without changing its chemical composition. In this paper, the researchers wanted to create a material that could reversibly switch between two different topological states, which has not been done before. 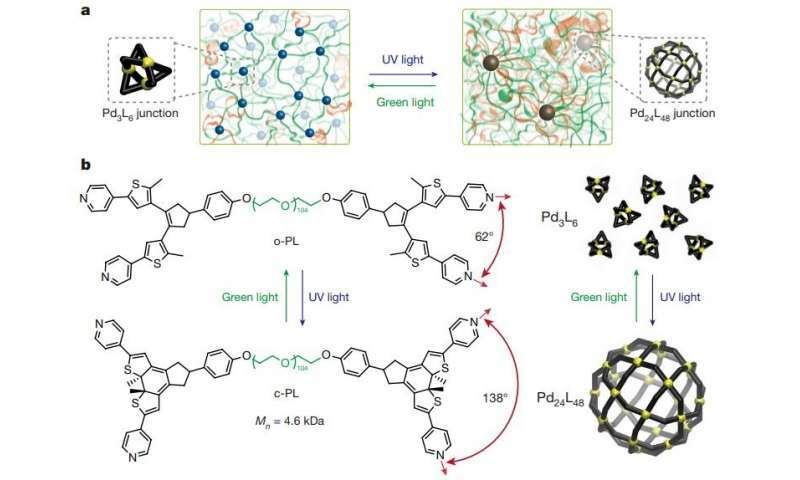 Johnson and his colleagues realized that a type of material they designed a few years ago, known as polymer metal-organic cages, or polyMOCs, was a promising candidate for this approach. PolyMOCs consist of metal-containing, cage-like structures joined together by flexible polymer linkers. The researchers created these materials by mixing polymers attached to groups called ligands, which can bind to a metal atom. Each metal atom—in this case, palladium—can form bonds with four ligand molecules, creating rigid cage-like clusters with varying ratios of palladium to ligand molecules. Those ratios determine the size of the cages. In the new study, the researchers set out to design a material that could reversibly switch between two different-sized cages: one with 24 atoms of palladium and 48 ligands, and one with three palladium atoms and six ligand molecules. To achieve that, they incorporated a light-sensitive molecule called DTE into the ligand. The size of the cages is determined by the angle of bonds that a nitrogen molecule on the ligand forms with palladium. When DTE is exposed to ultraviolet light, it forms a ring in the ligand, which increases the size of the angle at which nitrogen can bond to palladium. This makes the clusters break apart and form larger clusters. When the researchers shine green light on the material, the ring is broken, the bond angle becomes smaller, and the smaller clusters re-form. The process takes about five hours to complete, and the researchers found they could perform the reversal up to seven times; with each reversal, a small percentage of the polymers fails to switch back, which eventually causes the material to fall apart. When the material is in the small-cluster state, it becomes up to 10 times softer and more dynamic. "They can flow when heated up, which means you could cut them and upon mild heating that damage will heal," Johnson says. This approach overcomes the tradeoff that usually occurs with self-healing materials, which is that structurally they tend to be relatively weak. In this case, the material can switch between the softer, self-healing state and a more rigid state. In this paper, the researchers used the polymer polyethylene glycol (PEG) to make their material, but they say this approach could be used with any kind of polymer. Potential applications include self-healing materials, although for this approach to be widely used, palladium, a rare and expensive metal, would likely have to be replaced by a cheaper alternative. "Anything made from plastic or rubber, if it could be healed when it was damaged, then it wouldn't have to be thrown away. Maybe this approach would provide materials with longer life cycles," Johnson says. Another possible application for these materials is drug delivery. Johnson believes it could be possible to encapsulate drugs inside the larger cages, then expose them to green light to make them open up and release their contents. Applying green light could enable recapture of the drugs, providing a novel approach to reversible drug delivery. The researchers are also working on creating materials that can reversibly switch from a solid state to a liquid state, and on using light to create patterns of soft and rigid sections within the same material.